This is what the Masters in Taxation Program strives to accomplish. The MST Program gives students the tools to think clearly, concisely and critically – skills that can be applied to any profession. 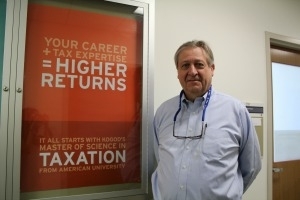 The MST Program at the Kogod School of Business is the only Master of Science in Taxation program in the area, and one of the few offered on the East Coast. Washington, D.C. is a second classroom. Students become more than just observers – they are active learning members in the city. The Tax Policy class takes trips to the Treasury Department, the US Tax Court, the Joint Committee on Taxation and the IRS’ national office. Interested in the MST Program? Here's more information.